Maria Cristina Pimiento earned her Business Management degree from the Universidad de Los Andes in Colombia. Following her undergraduate work, María Cristina came to the United States, where she was eager to enhance her education, earning an MFA from the Actors Studio in New York City. 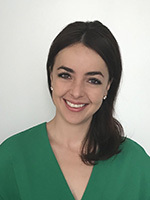 With a degree in business and her experience making the transition to the U.S. for her graduate work, Maria Cristina is uniquely suited to assist Expert Admissions’ Latin American clientele. Maria Cristina is also a renowned artist in Colombia and was awarded the India Catalina Award for Best New Artist (2004). Maria Cristina is a member of the International Association for College Admission Counseling (IACAC) and the National Association for College Admission Counseling (NACAC).